The combine is almost over and the draft is still a while away but who you liking so far. Who can get this team over the hump and to a Super Bowl? I'll start off by saying I really wish Brandon Scherff's tape wasn't so freakin dominant. If we were picking a little higher, I would love a trade up for him. Usually the Draft is by FAR my favorite time of the year. I can darn near list the height/weight/school/shoe size of the top 50 players lol, but this year I hardly even watched the combine at all. I'm losing it as a football fan. I haven't even posted on this site in a long time.....work, house stuff, first time dad in June.....all this stuff. I'm scared that I dont even know who I am anymore. Normally by this time id have my first mock draft completed. I havent even started. So to answer your question.....I just dont know. Someone, help me be me again!! This is the first year I actually might attend the Draft, and I hardly know any of the prospects. Just an early list, I'm sure the talent boards will fluctuate by d-day. Just hope they get a quality talent that contributes immediately, but Mayhew will probably truck it up. I'm not overly happy with any of the DT prospects this year, at least not with the ones who'll be available at 23. DE and OL however seem like a good group this year, so unless Shelton drops to us at 23, go for OL/DE. I think we can still land a speedy RB in the second or third (Abdullah anyone?) seeing as there's a lot of them. I wouldn't touch DGB with a10ft pole. I smell Diva/Bust all over him. he has a laundry list of off the field issues, and school transfers. Shelton won't drop to 23, we'd have to make a move up to get him. Trae Waynes would be a nice pick up, but after his blistering 40 times I can see some team looking at him as a possible top 10, or at the very least top 15 player. No other CB is worth a first round pick to me. A player like Cameron Erving would be nice, since he can play any position along the offensive line. But he might go earlier, because some scouts are viewing him as another Zack Martin-like prospect. And while we have a few DEs on the roster, none of them (other than Ansah) are really all that impressive. Devin Taylor is still developing, and I don't think he'll ever be as dominant as you would think. He doesn't have an explosive first step, and he doesn't use his arms that well during his rush. Jason Jones is OK, but not a strong pass rusher. George Johnson was a nice surprise, but he's a rotational player and not what I feel is a 'go to' guy when you need a big play from the DE spot. So if the Lions had a strong pass rusher fall to them at #23, I'd think it would be smart to make that the pick. I think if McKinney falls to us, he has to be a consideration to take over at Mike. Even though Tulloch is still under contract, and Tahir Whitehead filled in pretty well, McKinney is the best pure ILB available and could secure our LB corps for years. Since the Lions are looking at installing some 34 packages, he could team with Whitehead pretty well in that regard. Plus, Whitehead would be pretty strong as a backup at all three LB spots. Despite the fact that I've strongly suggested that the Lions should get another strong receiver, I am not in favor of them doing that in round one this year. The WR is deep, and good talent can still be hand in the third round. I would be greatly disappointed if the Lions went RB in round one. GREATLY disappointed. We need to fix LG and RT before we do anything about RBs. What I've been thinking of late is, is it worth trading away the 1st round pick in favor of, say a 2nd and a 3rd/4th? There might be teams willing to trade back into the 1st round or move a few spots up if someone like a Shaq Thompson or Lael Collins were to slip and still be on board at the 23rd. This class seems a little bottom heavy potential-wise than top heavy to me, we could possibly pickup a raw prospect like Quinton Rollins/PJ Williams or someone like Grady Jarret late in the 2nd and still have a couple of picks with which RB and OL can be addressed. where we pick at, there isnt a ton of value to trade back. we would have to move WAAAAYYYY back to mkid to late 2nd just to try and snag an extra 3rd. Not worth it IMO.
" trading away the 1st round pick in favor of, say a 2nd and a 3rd/4th? " Great idea, all for it if they can get a decent offer. But if La'el Collins is there at 23 the Lions might want him, as he fits the versatile G/T they profess to have interest in. This years draft looks quite good for O-line talent, especially guys listed at Tackle, alot of depth, we could see some talented kids still there in the middle rounds. Yes, I listed centers too. We only have one and he's not fully proven, plus if he gets hurt again we're screwed. We need to address this for insurance. I like Finney, but think the Lions won't spend a pick, opting to get a FA after the draft. As for Tackles, I like Jake Fisher and Donovan Smith, neither are considered 1st round talents at this point. 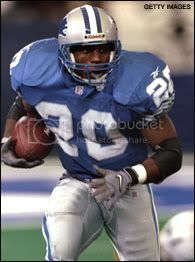 At Guard I like Laken Tomlinson, John Miller, and Jarvis Harrison. Now that the Lions have dumped the oft-injured and under-performing Bush, I think we'll be addressing RB at some point in the draft. If Gordon or Gurley is the choice early I could live with that. Although it is a RB rich draft and a quality back would probably still be available in the 2nd thru the 4th. My favorite is Tevin Coleman. I wouldn't be surprised to see McKinney available in the 2nd round. Watched a couple of their games this past season just to see him, thinking I was gonna see something like Urlacher. I was disappointed. Agree, the WR is deep, and good talent can still be hand in the third round, but if top wide-out falls in the 1st like Devante Parker or Jaelen Strong, it should be considered. The luxury of having 3 quality WR's would be huge. Joe I'd be with you if we still had Schwartz as our coach but if Caldwell likes him enough to take him later, I'd be good with that. If anyone can help him its guys like Caldwell, Megatron, Tate, Mayhew, and Stafford. I think we are finally starting to resemble a PROFESSIONAL football organization. After watching the Combines, I really like Laken Tomlinson. He has good quickness, moves really well, seems to keep his knees bent and has good pop with his arms. If he's available in round two when the Lions pick, I think he's a good choice there. He may not be as powerful as Warford, but he seems more athletic and would be a good replacement for Sims. If the Lions do franchise Suh, or somehow sign him to a new deal, then going DT in round one would be foolish unless a really good player drops to us there at the DT position. Otherwise, they should be looking at CB, OT or maybe even a DE if possible.